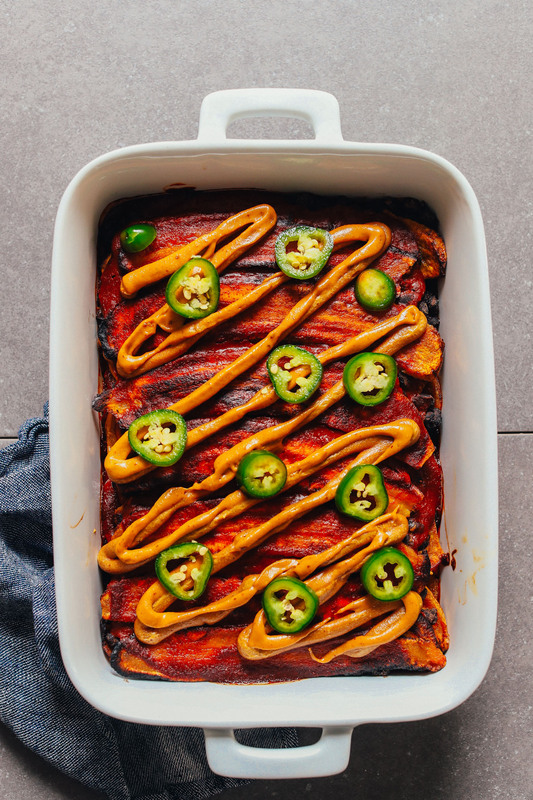 Friends, behold one of the best things that’s ever come out of my kitchen: a savory, saucy, Black Bean Plantain Enchilada Bake! Just 10 ingredients required for this incredibly flavorful, hearty, comforting dish. Let’s do this! 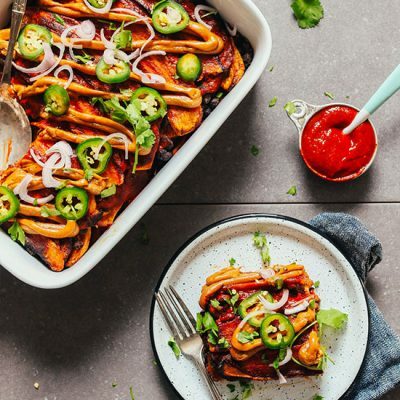 This isn’t your average enchilada bake, as it relies on roasted slices of plantains in place of tortillas, which not only add a naturally sweet balance but also keep this recipe both gluten- and grain-free! 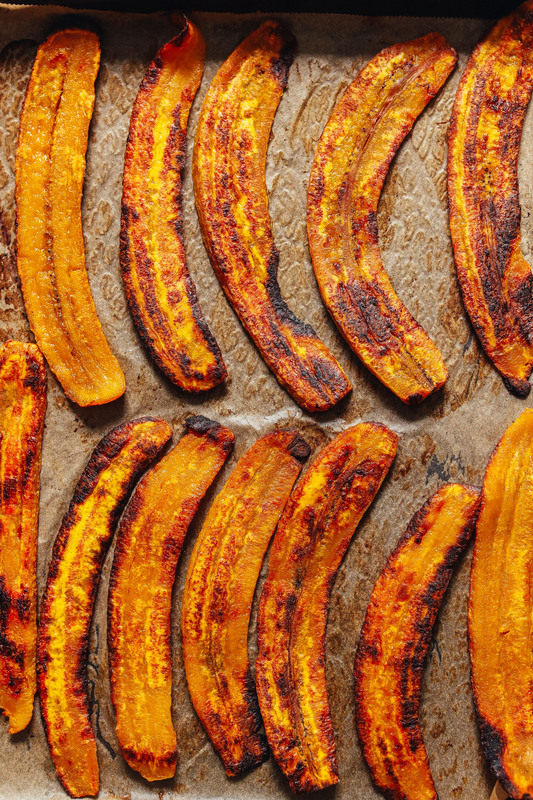 Just check out those plantains roasted until golden brown and slightly caramelized – swoon! The next layer is black beans simply spiced with cumin and sea salt. 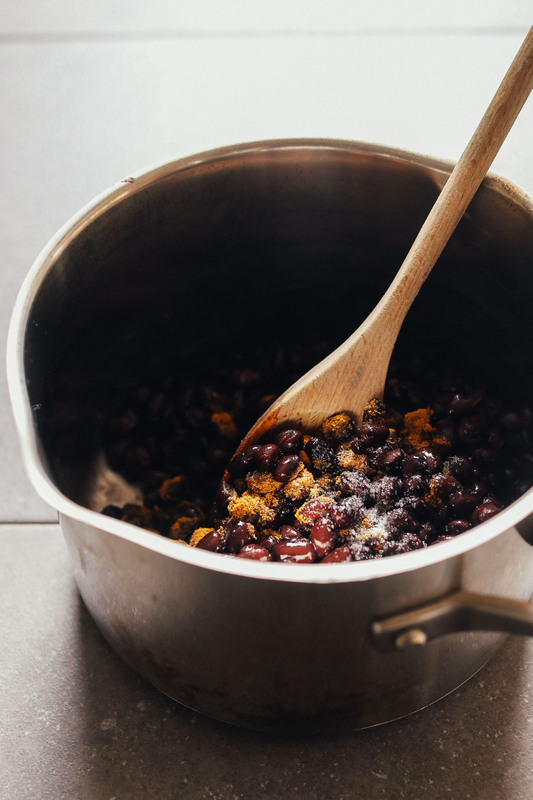 We went with canned to save time, but you could also make our 1-Pot Black Beans from Scratch if you’d rather! All that’s left is sauce, and we went with two: a combination of our Easy Red Enchilada Sauce and this Creamy Cashew Queso. The two together make this dish saucy, cheesy, smoky, and utterly delicious. Now, let’s layer. Layering is my favorite part because it’s so darn fun. 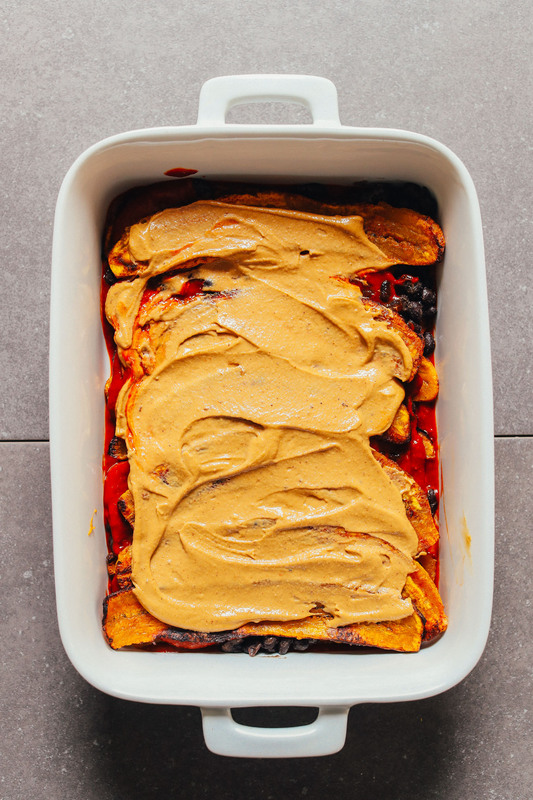 Start with sauce, then plantains, then beans, cheese sauce, and so on and so forth until you have a multilayer, flavor-packed masterpiece that’s ready for the oven. Just a quick bake and it’s ready for your dinner table! This would make such a delicious meal for both weeknight dinners and hosting friends. It can also be prepped ahead of time, refrigerated, and baked later on to save time! While delicious on its own, this bake would also pair well with Garlicky Guacamole + Baked Plantain Chips, Easy Red Salsa and chips, Mexican Quinoa Salad Cups with Avocado Dressing, 7-Layer Vegan Mexican Dip, and Ginger Beer Margaritas! If you try this dish, let us know! Leave a comment, rate it, and don’t forget to tag a photo #minimalistbaker on Instagram so we can see what you come up with. We sincerely hope you enjoy this dish! Cheers, friends. 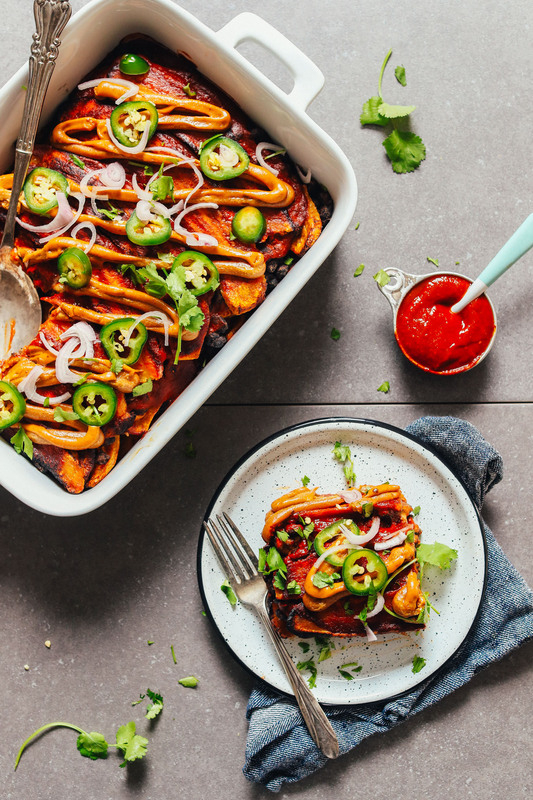 A flavorful twist on classic enchiladas with roasted plantains, black beans, smoky enchilada sauce, and cashew queso! Just 10 ingredients required, hearty, flavorful, and so delicious! Preheat oven to 425 degrees F (218 C) and line two baking sheets (or more as needed) with parchment paper. Carefully peel plantains, and one at a time, lay on a flat surface and thinly slice lengthwise - each plantain should yield about 5 thin slices. Arrange on your baking sheets in an even layer. Brush plantains with melted coconut oil (or spray with coconut oil) on both sides. Bake for about 20-30 minutes or until golden brown on both sides, being sure to rotate the pans and use a spatula to carefully flip the plantains near the halfway point to ensure even baking. You’re looking for tender, golden-brown plantains with a caramelized taste. Set aside and lower oven heat to 375 degrees F (190 C). In the meantime, add drained black beans to a large saucepan and add cumin. Heat over medium heat until bubbling, stirring frequently - about 5 minutes. Season to taste with salt and stir. Then turn off heat and set aside. To make the spreadable cheese, add raw cashews to a food processor and process into a butter, scraping down sides as needed. Add spices and chipotle pepper and mix until a thick spread is formed. Then add warm water a little at a time and blend until a creamy spreadable “queso” sauce is formed. Taste and adjust flavor as needed, adding more chipotle pepper for heat, cumin for smokiness, salt for saltiness, or nutritional yeast for cheesy flavor. Set aside. To assemble your enchilada bake, spread a thin layer of the enchilada sauce on the bottom of a 9x13-inch (or comparable size) baking dish. (If multiplying this recipe, use more baking dishes as needed.) Then add a layer of plantains. Next, add a thin layer of cheese sauce. Then add half the beans. Next, add a generous layer of enchilada sauce followed by another layer of plantains. Next, add another thin layer of cheese sauce and top with the rest of the beans. Add another layer of enchilada sauce, reserving a small amount for the top player. Then add your last layer of plantains and brush with/spread any remaining enchilada sauce. Top with any remaining cheese sauce - we scooped ours into a plastic bag, cut the corner off, and piped it on for easy application. But you can also just spread it on with a spoon. Cover with foil and bake 30-35 minutes at 375 degrees F (190 C) or until hot and bubbly on the edges. Remove from oven and let cool briefly before slicing and serving. Enjoy as is or with sliced jalapeños, onion, or fresh cilantro. Guacamole would also be a great addition! Freeze leftovers up to 1 month or store covered in the refrigerator up to 4-5 days. Reheat in a 350-degree F (176 C) oven until hot. I don’t have a food processor. Is there something I can buy in the store in substitute for the processed cashews? A cashew-based queso or nut cheese should work. If it is too thick, you may need to thin it with a little water by whisking in a bowl. Hope that helps! This was a little labor intensive with making the red pepper purée (used a food network recipe) and cashew sauce. But sooo worth it! I halved the recipe and made it in a loaf pan. I could have used 1 more plantain (used 2). Made it the day before and baked it the next day. Even the carnivore liked it! Thanks for all your great vegetarian/vegan recipes!!!! I was wondering if anyone has frozen the leftovers. I am one person in a house of meat eaters (I am vegetarian for medical reasons). I want to do more meal prep and freeze things for ease so I don’t go to the easy but bad for you food choices. Any suggestions? So I made the beans in a saucepan after sautéing 1/2 yellow onion, 1 chopped carrot, and 3 garlic cloves. I stirred in 1/2 chipotle and some southwestern taco seasoning, then mashed 1/2 the mixture and mixed altogether (I love this consistency for beans). I also found it difficult to make long slices of the plantains given their awkward shape, so cut them in half first. I did use canned red enchilada sauce as a timesaver. This was AMAZING!!! Made it for Valentine’s Day dinner last night, and I am still in disbelief of how BEAUTIFUL it looked and how INCREDIBLE it tasted !!! You are a true genius!!! I do have one major complaint though… how on Earth is this 12 servings ?! We ate all but one slice, and finished that slice this morning…! Thank you SO much. I am such a fan ! We don’t have any dietary restriction. Is there anything that I can use to substitute for the nutritional yeast? Thank you! Brewer’s yeast is your next best bet! So I made this dish last night with high hopes and the only thing I was not pleased with was the cashew cheese sauce. 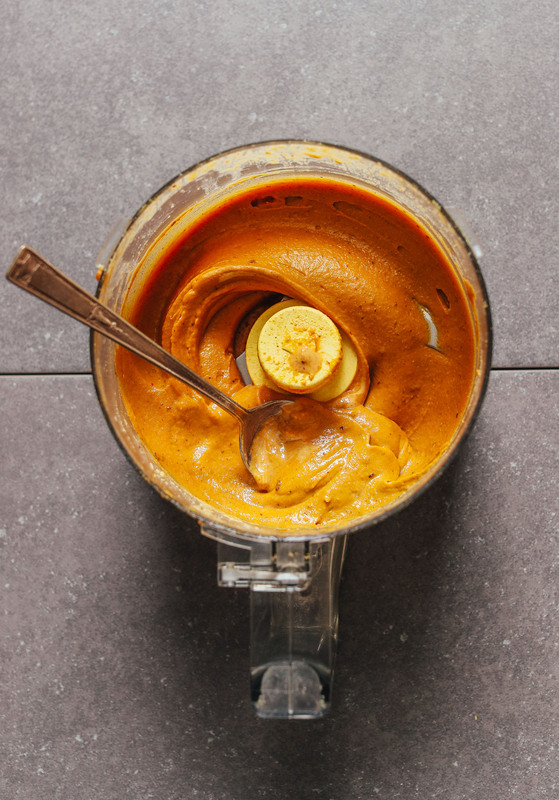 I watched the video that comes with this recipe at least 10 times trying to figure out how you made nut butter in a food processor while I was kicking my Vitamix into overdrive and not getting the same results!! I believe if I had soaked the cashews prior to blending, it would have been a much creamer, but still firm sauce. Instead, it was crumbly and took me a full 20 minutes just to get it look similar to yours. Besides that, I added some corn and guac to the dish with some brown rice and the side and it wasn’t bad. I’ve kearned my lesson using cashews. I always soak them. Otherwise it’s grainy. This was AMAZING. Although I think depending on the size of the plantains, you might need more than 4. I could’ve used 1 or 2 more, as they didn’t all yield the same size slices. Regardless, this was really delicious. I thought I’d had every variation of a plantain possible (being Hispanic and all) but this was really unique. Great! Thanks for sharing, Mer! Eek, I can’t believe I had never cooked with plantains before! Full disclosure, I didn’t think they were cooking correctly at the beginning (it’s because I sliced them too thin and they were kinda burning) so I chickened out a little and did half the bake with corn tortillas and half with the plantains. 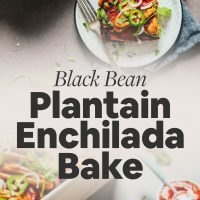 I just tried it and OMG, amazing, and the side with the plantains so much better! They’re like thick, delicious, corn tortillas, except made by Mother Earth! I only used a tiny bit of oil in my Misto but next time I will try it oil free. Newly vegan husband gave it two thumbs up as well. We’re vegan and having some paleo-leaning friends over for brunch tomorrow, I knew I could count on you to provide me with the perfect thing to make for all of us!! You rule. This was amazing! Made it the other night and it was easy and so yummy! I cut the recipe in half for just my husband and I and I still had leftovers for me for lunch the next day. Will make again 😊 Thabk you! Great! Thanks for sharing, Maggie! I made this last night, and instead of a pretty, perfect looking casserole, mine looked like a pile of slop. But looks can be deceiving because it was pretty darn tasty I’ve never cooked with plantains before, but they pair perfectly with everything else in this dish. I think my real problem was just that 4 plantains was not enough to properly fill up 3 layers of plantains in a 9×13 pan. If I make this again I’ll grab ~6+ plantains to do the trick. I wasn’t sure about this recipe going in, but absolutely enjoyed it. The flavors of everything were perfect, and I didn’t adjust a thing. Although, I did choose to omit the optional small chipotle chili in adobo sauce when making the cheese sauce. I’d recommend getting an extra plantain just in case. Using a 9×13 glass pan, and cutting each into 5+ slices, I wasn’t able to make a complete 3rd layer. I also ended up using more sauce (I made Minimalist Baker’s Easy Red Enchilada Sauce) than the recipe called for. I have a sneaking suspicion the plantains I used for this recipe weren’t quite ready but the dish still tastes pretty good, all things considered! I bet it’ll taste even better when I try it with the jalapeño topping and a dollop of avocado tomorrow evening. How long do you suggest reheating one serving at 350 to get it heated throughout? I want to make sure the plantains are hot but not overcooked so I appreciate the feedback! I’d try 10-12 minutes or so and then check it! Yay! Thanks for the review, Sarah! This is a delicious, filling and starchy dish. I used canned black beans and El Pato sauce to save time. I added some roasted bell pepper and cauliflower. Smart! Thanks for sharing, Grace! Tasted great! Excited about the queso because it’s really versatile. I cheated and used Trader Joe’s Enchilada Sauce. Topped with avocado, red onion and cilantro. Thought about cubing the plantains next time to make it dip-ish. You could serve it on top of tortilla chips for a yummy version of nachos. Do you think this would be just as good with green enchilada sauce? I think it would produce a different flavor, but it would still be delicious! Hmm I’m wondering if you used too much sauce which resulted it in sliding around more? I only used 1.5 cups of sauce- only because that’s what’s in a jar from Trader Joe’s, and mine held together great! Made this last night and it was great! It took a little longer than I realized so it might not be a good weeknight meal but we had extra time on a Sunday. I ended up cutting all the plantains in half then standing them up on the cut side and cutting into 5 slices and it worked really well. The cheese sauce was amazing!! We topped our slices with cilantro, pickled jalapenos and avocado but it was so good that there’s no way we get 12 servings out of it! One of my favorite meals EVER! Thanks! Yay! Thanks for sharing, Alex! We are so glad to hear that, Julie! Long time reader, first time commenter. I just made this and it is Soooo good! I can’t believe how good the cashew cheese is. The flavors are so great together. I will say that I wish I had doctored my black beans a bit more. Also, I don’t know if it was the heat settings or the way I sliced the plantains, but they were a blackened instead of Brown. I also need to get the proportions right. I adjusted it for four servings and I didn’t have enough layers. Despite all that, it still turned out delicious. Several of my smaller slices were blackened as well. All the plantains I cut into 4 (vs. 5) slices seemed to fare a bit better. Hope that helps! This recipe was a hit with everyone I shared it with! When I make it again I will soak both the dried peppers for the enchilada sauce and the cashews for the cheeze filling. The peppers never did get soft and the cashews were too thick. I also had a problem finding decent sized plantains here in western Colorado. It was still super delicious!! I’ll make it again except I’ll supplement the plantains with sweet potato. I’d never made enchilada sauce before and I’m hooked! Thanks for your wonderful emails and recipes. I just made this for dinner tonight and it was so so delicious! All 3 of my kids loved it, we halved the recipe for the five of us as I wasn’t sure how the kids would like the plantains (they haven’t been fans in the past) but now I wish I would have made the full portion! Great recipe, we’ll definitely make it again! I had so much fun making this. It was a hit. The plantains werent fully ripe but still were so delicious when roasted. I used canned enchilada sauce to save on time prepping. The cashew cheese sauce was amazing!! My husband and I love this dish and it’s bookmarked for my go-to recipes. Thank you for the recipe! Glad to hear it, Andrea! There are just a few changes I made, based on a flavor I don’t like (chipotle) and what I had on hand. Only 3 of the four plantains I bought for this got ripe, and I couldn’t wait any longer for that fourth one! I purchased frozen mini plantains from Trader Joe’s to make up for it, but they weren’t qite as ripe. Still good though. Next time I make this, I will either be patient and use 5 plantains, or use a smaller pan than what I did today since I only got two layers. Anyway…I used Tapatio in the cashew queso, and will use more next time for extra spice, and also a little more water so it isn’t so thick and sticky, and will blend in my Vitamix instead of the food processor. The flavor was great though, and I would love to use it as a dip. I made my own enchilada sauce with canned organic chopped tomatoes and paste, plus seasonings, and it was great but also needs more spice. It baked up really well and I thoroughly enjoyed it, topped with cilantro. Would be extra yummy with some avo slices or guac, or the cultured cashew sour cream. Our family is trying to transition to a more plant based diet (we have a 2 year old son). Most recipes that are toddler friendly have cashews in them but our little guy is allergic to them 😭😭😭 is there an alternative to the cashews in all these vegan cheese sauce recipes? Hi Jackie! It all depends on the recipe, but for this one in particular, you could use sunflower seeds in place of cashews if that helps? For other recipes that call for cashews, we often recommend a silken tofu or other alternative in the comments! This was SO good! It might be one of my all time favorite recipes! The only thing that didn’t work for me was a 9×13 pan. There was no way I could have filled that. I used an 8×8 and it worked perfectly. I added a quarter of a chipotle pepper and my son (7) complained that it was too spicy but my husband and I didn’t find it too spicy at all. Topped with green onions, cilantro and avocado. Will definitely be making again soon! I made this recipe exactly as directed, and it turned out absolutely delicious! The queso was very addictive! Next time, I’d add two more plantains to fill in the space a bit more. This was great! I loved learning how to adapt the Parmesan to a sauce. So good! I baked the plantain for just under 30 minutes and it was too long, they were too tough. Definitely will watch them as they’re baking next time. I would add more enchilada veggies next time because I don’t think it’d hurt and would add some different flavors. I used the meal as a dip with fries because the store only had half the amount of plantains the recipe called for and it turned out very saucy. Such a comfort food dish with fries!! Ohmygosh, this is a brilliant idea! I’d be interested in making this, but 1 1/4 cups of cashews would cost close to $10 here! Is there a more economical substitute? Hi Lucy! You could use sunflower seeds in place of cashews if that helps? Yum!!! We just tried this tonight and loved it! I made exactly as written and topped with chopped white onion, cilantro, and a squeeze of lime. We’re meat/dairy eaters, but didn’t miss it in this dish. Thanks, so fun and delicious! We are so glad to hear that, Lisa! I made this and it was fantastic. I will also use the cheese sauce and enchilada sauce recipes for other dishes. The plantains I used weren’t ripe enough though and some came out a bit too crunchy. So I would follow the advice on using ripe plantains. I will definitely make this again. There is no liquid to add to the black beans? I got it going but not sure it will “bubble”, as you wrote, without liquid. But I am hoping for the best as these are a lot of my favorite ingredients: needed a way to use plantains again. It should bubble, Scott! Hope you love the recipe! Hi and thanks for you do! Can I use green plantains in place of the ripe spotty ones or will it change the flavor too much? Thanks! We recommend using ripe (spotty) plantains for best flavor! I absolutely love this recipe! I’d never cooked with plantains before — and discovered that slicing them before peeling made it so much easier to get thin slices. The cheese sauce was amazing…and I woke up the next morning and had it for breakfast!! Do you soak the cashews? Hi there! No, you don’t need to soak them. You can if you want, of course. But it’s not necessary. And for future reference, if it doesn’t say soaked in the recipe, then there’s no need to soak! This was delicious and fun to make. Next time I will try your recipe for enchilada sauce and I will use a slightly smaller pan, or a few more plantains. I had a lot of dead space around the edges. It was even more flavorful the next day. Thank you! I feel so sure of this recipe, I am taking my first try to a vegan potluck. Whoop! Hope its a hit, Dave! 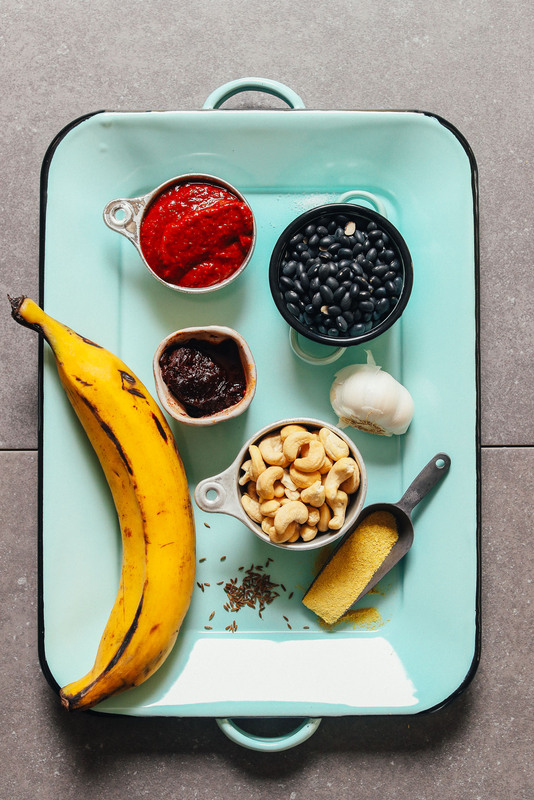 My favorite three things in one recipe, beans, ripe plantain and cashew chesse sauce. Hi Dana, I was wondering if you could sub your “cashew-less queso” for the cashew cheese. Cashews are pretty pricey where I live. Thanks! We haven’t tried doing that, but its worth a shot! Report back if you give it a try! Thank you so much for sharing this recipe! I have to say, the cashew “queso” was amazing! I didn’t add a pepper to the queso, but just a little adobo from the chipotle can and that was enough to give it a smoky flavor and remain mild enough for my 5-year old to eat. I felt like there was something missing from the enchilada sauce, and after the fact, I realized there was – the tomato paste! I completely forgot to add it. It was good as it was, but that would definitely have pushed it over the edge into greatness. I decided to add fresh corn off the cob when I layered the black beans. I didn’t cook it, just sprinkled some on with the beans. I liked the addition. What a fantastic way to use plantains – this was the first time I had ever cooked with them. This recipe was worth the effort – thanks again! We are so glad you enjoyed this recipe, Michelle! Is it necessary to use ripe plantains ? I have always thought using the green plantains get the best result. We had the most success with ripe, spotty plantains, but if you experiment, report back on how it goes! Eating the leftovers right now! Delicious as always! Woot woot! Glad to hear it, Emma! Yay! Thanks, Alex! So glad everyone enjoyed. Whoop! Glad to hear it, Alex! Last month, my family and I visited this Mexican restaurant that served the most delicious plantain chips! Seeing the plantains laid out on the baking tray reminded me of them. 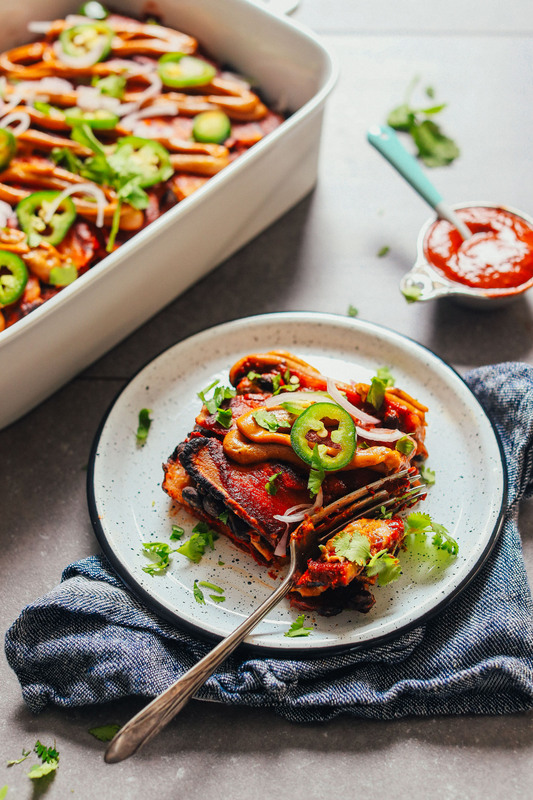 This is a really fantastic take on enchiladas with a superbly creative twist! I could dig into two servings of these enchiladas any day! Approximately one generous 3-inch x 3-inch square. Wow! We made this for our evening meal today and it was really, really good. Kids and adults enjoyed it. I served it with grilled corn tortillas and some at it with those and others at it as-is. We used cilantro, onions and guac as toppings. I did add 2 peppers to the queso, but we like things spicy. Yum! We are adding this to regular routine. Smart!! Thanks for sharing, Amanda! This is an awesome recipe. My wife, however, is sensitive to tomato based products, so I substituted a hatch green chile enchilada sauce. Needless to say, the results were still fantastic. And the plantains were firm and chewy, making them a perfect replacement for tortillas. I just took mine out if the oven…DELICIOUS! While it doesn’t look as pretty as yours (I let that pipe dream go before I began😊) and I doctored the beans up a bit (minced garlic, onions, peppers and shredded carrots), I love every bit of this! I also love that it was inexpensive to make. The most expensive ingredient was the enchilada sauce at about $2.50. All the other ingredients are pretty much staples in my house. Thank you Dana for this flavorful dish! I just made this and it is delicious!! I used canned beans and canned enchilada sauce which made it so easy! This is definitely a new favorite for me. Do you think I could cook the plantains without oil? Either air frying to cook it (no oil of course) or baking just without the oil? Just skip the oil! Or even toss in a little maple syrup! Hi there! Hope your having a great holiday weekend. Just wondering if you could do this with eggplant as I don’t have any plantains? Many thanks for all the amazing recipes! Hmm, it would definitely be different but it might work! Let us know if you give it a try! Any alternatives for the enchilada sauce? I can’t do nightshades. Hmm, that’s a tough one. I might suggest just leaving it out and sticking with the cheese sauce! I’ve made really decent enchiladas using Nomato sauce as the base for my enchilada sauce. I added a bit of agave, cumin, onions, garlic, etc to get it tasting the way I like. In this recipe, I’d just swap out the tomato paste and broth for Nomato sauce. Dana, I’m trying this recipe tomorrow but plan to swap out the plaintian for some eggplant I just picked up from my local farmer. I’ve never incorporated it in a Mexican dish before but will be salting then seasoning with cumin, chili powder, and paprika. My initial thought is that the bake time of 30-35 minutes will be enough to cook it through and I don’t need to cook it separately first like the plantains. Will let you know how it turns out, advice welcome! I made this last night with eggplant and it went really well! I salted and cooked the eggplant according to the lasagna instructions, but laid them flat in the dish instead of rolling them up. I subbed jalepenos for chili peppers I had from my garden. Served with avocado, green tomato salsa, and greek yogurt. I loved the dish! And my boyfriend went back for 3rds :-) It was a big hit. I bought enchilada sauce instead of making my own. So, there’s canned chipotle peppers in adobo sauce. I suggest starting by using 1 or half of 1 small chipotle pepper for heat. For a less spicy cheese sauce, omit! Hope that helps. Oh this looks absolutely amazing!! Could you please recommend an alternative sauce to be used instead of the cheese sauce? Unfortunately, no one in my house likes “cheesy” sauces but I so want to make this recipe! Hmm, I’d just double up on plantains and beans and top with plenty of guac! Hi! I get excited reading all of your recipes, however, my son has a severe nut allergy. Is there anything you (or anyone else) suggests as a substitute? Yes, sub sunflower seeds for the cashews! “One of the best things to ever come out of my kitchen..” not certain about THAT comment..you have SO MANY amazing creations! Good, but my sauce/final project didn’t turn out quite like your pictures. Ant hoo..very tasty! Thank you for your lessons and inspiration! Ha! Hope you love this one as much as I do!